The stylish sleigh panel headboard of this bed has a gentle curve, which is complemented by the handsome bun feet on the footboard. An added feature to the footboard is the spacious storage drawers perfect for holding bedding, extra clothes, pillows, and other bedroom essentials. With this added convenience you can make the most of the space in your room. The drawers showcase antiqued brass knobs. All this provides you with a bed to truly enjoy. 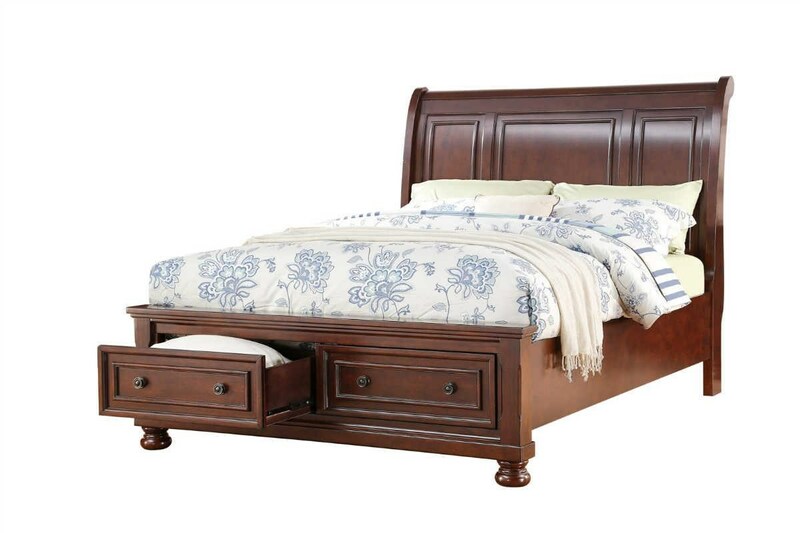 The Sophia Queen Storage Bed by Avalon Furniture at Great American Home Store in the Memphis, TN, Southaven, MS area. Product availability may vary. Contact us for the most current availability on this product. Stylish yet functional, the distinctive Avalon Furniture Houston collection boasts classic lines with gentle curves. The sleigh storage bed features a tall headboard with divisions and two wide drawers on the footboard providing extra storage space. Together with the complementing stylish casegoods, the collection is finished in a warm cherry for the much sought deep color and rich, natural texture. The Sophia collection is a great option if you are looking for Traditional furniture in the Memphis, TN, Southaven, MS area. Browse other items in the Sophia collection from Great American Home Store in the Memphis, TN, Southaven, MS area.